Lian Li was one of the first manufacturers to produce mini-ITX cases as part of its core I product line, matching its legendary aluminum construction and build quality with the emerging mini form factor. One of its latest cases, the Adventurer-branded PC-TU200, has a basic appearance that matches Lian Li's long-serving PC-Q08, with a sleek flight-case look and improved rigidity to match. Made almost entirely from aluminum, the TU200 is extremely light at just 3.49kg. Lian Li has also reinforced each corner with machined aluminum guards, which are riveted into place around the core chassis to reinforce and protect the case during transit. Adding credo to its Adventurer tag is the plastic carry handle on the case's roof, enabling you to easily grab the case ready to cart off to a LAN party. Meanwhile, side-panel and roof venting is conspicuous by its absence, with a large vented area at the front case allowing airflow into the single 140mm intake fan. There's also a ventilated section in the base to provide airflow to the floor-mounted graphics card, but only the front vent is fitted with a dust filter, and if it requires cleaning, you'll need to remove the fan. Elsewhere on the case's front fascia is a pre- stealthier 5.25in drive bay, a common inclusion with Lian Li's cases, and a touch that makes a case look much more complete and stylish than a bare drive face plate. Meanwhile, a front panel with a pair of USB 3 ports, an eSATA port, and 3.5mm microphone and headphone jacks is located at the bottom of the case's front, while combination power/power LED and reset/hard drive LED buttons sit in the middle of the front fascia. With the reinforced aluminum plates around the case's corners and along its length, there's no immediately obvious way to remove the recessed side panels. This is achieved via a pair of levers at the rear of the case, secured with thumbscrews that pry the left and right panels out of tool-free clips inside the case. It's a slick process, enabling the case's sides to appear smooth and free of any fittings, although you'll need to pull the panels free once the levers pop a corner out. Lian Li even includes a rubber-capped graphics card holder to negate board-bend on longer cards. Inside the case, the motherboard is fitted to a motherboard tray, rather than directly to the side panel as with the PC-Q08, with a four-drive 3.5in hot-swap drive cage on storage duty. The drive cage is fully removable, but it's cleverly placed so that a graphics card, mounted along the case's floor, can fit beneath it without having to compromise on storage space. Lian Li even includes a rubber-capped graphics card holder to negate board-bend on longer cards. However, the hot-swap bays, while kitted out with excellent vibration- dampening mounts for 3.5in drives, don't quite fit 2.5in drives. As they don't reach the hot-swap connectors, you'll need to connect these to their cables yourself; an annoying task that requires some serious finger dexterity to work around the existing hot­swap fittings. Meanwhile, there's space for a PSU with a maximum depth of 140mm, which you mount by sliding it into the back of the case and fitting it over the top of the motherboard, although Lian Li seems ambiguous about which way around the PSU should be mounted. Its own website shows images of the PSU with its fan mounted towards the side panel, while the manual indicates it should be fitted with the fan towards the motherboard. Regardless, there's just enough room for airflow on either side. Fitting the PSU can be tricky, though, as the mount means the majority of cables will only be introduced at the final fit, making it difficult to route cables out of the way inside. 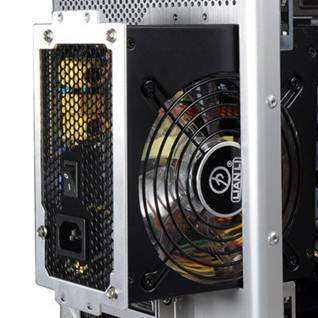 With a PSU mounted directly above the motherboard, CPU cooler headroom is limited to just 80mm too, but this is still enough for stock coolers or low-profile aftermarket coolers, such as our test system's Zalman CNPS8900. Due to the cabling constraints of adding the PSU last, however, building a PC inside the TU200 was a little troublesome and when we'd finished, cooling ability wasn't stellar. With its single 140mm intake fan, theTU200 managed a CPU delta T of 49°C - the hottest of any case on test, while its GPU delta T of 58°C was also on the warm side, although perfectly stable. The front cooling fan's noise proved slightly intrusive too and, with no additional fan mounts, there's no way to improve the situation either. While the Lian Li PC-TU200 certainly looks the part, decked out in gorgeous brushed aluminium, it's tricky to build inside, and it offers poor cooling thanks to its lack of fan mounts and venting. What's more, at $210, it costs more than double the price of the BitFenix Prodigy; despite its aluminium charms, the TU200 is a poor choice for those looking to build a full- spec rig in a mini-ITX case.